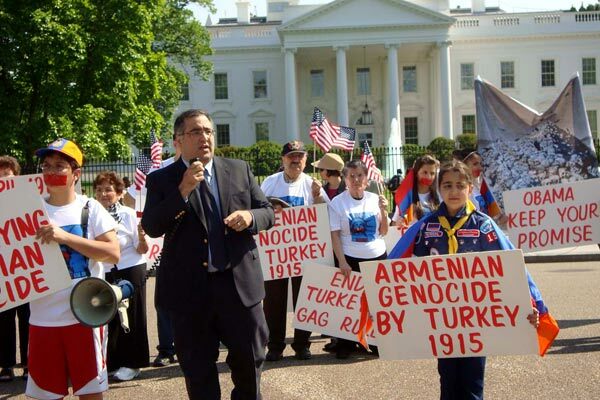 Activists outside the White House, led by Armenian National Committee of America’s executive director Aram Hamparian held a protest encouraging Obama to “keep your promise”. In a statement issued during a weekend retreat in North Carolina, US President Barack Obama on Saturday (April 24) re-affirmed his “own view of what occurred in 1915,” but, as expected, did not use the word “genocide” on this day marked worldwide by Armenians as the startup of a genocidal campaign 95 years ago by Ottoman Turks that killed 1.5 million. It is "a devastating chapter in the history of the Armenian people, and we must keep its memory alive in honor of those who were murdered and so that we do not repeat the grave mistakes of the past," Obama said in his statement. In his second Day of Remembrance statement since becoming president, Obama – who as a candidate had vowed to recognize the Genocide – used words now familiar to Armenian sympathizers who have lived through more than a decade of US presidents who betrayed campaign promises on the issue. "On this solemn day of remembrance, we pause to recall that 95 years ago one of the worst atrocities of the 20th century began," he said in a statement released while the president played golf. "I have consistently stated my own view of what occurred in 1915, and my view of that history has not changed," the statement said. "It is in all of our interest to see the achievement of a full, frank and just acknowledgment of the facts." The president’s statement says he is “encouraged by the dialogue among Turks and Armenians, and within Turkey itself, regarding this painful history." Obama did not mention, however, that – since a sharply-worded address by Armenian President Serzh Sargsyan Thursday, accusing Turkey of having stonewalled efforts at normalization -- dialogue has effectively been silenced between the two enemy states.